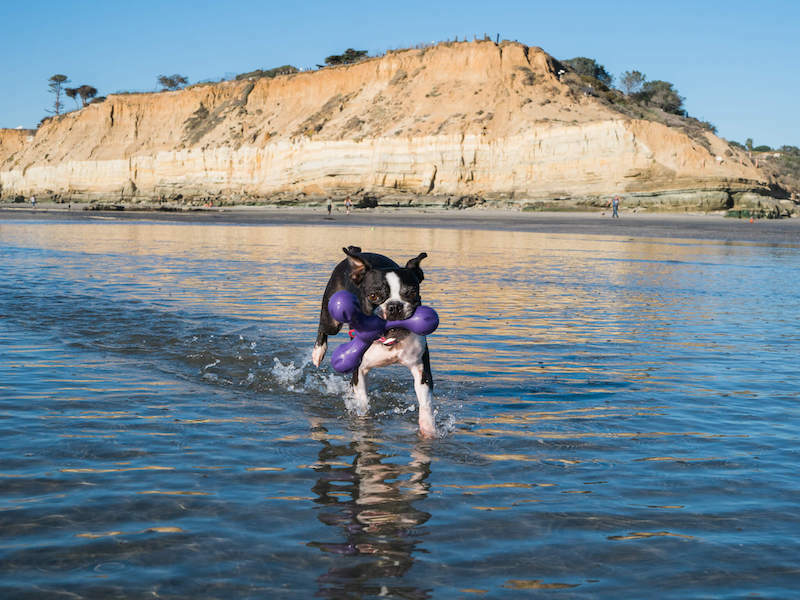 If I could have it my way I would go to Del Mar Dog Beach every day. Best Time to Go: Low Tide because the water goes out past the rocks. Expert Tip: Look to see how low the tide will be. It’s absolutely spectacular when the tide is a 0.0 or even -0.5. Off leash Labor day to Memorial Day. Leashed in between those months in the summer. Our favorite time to go are weekdays. Mainly because we’ll have the beach practically to ourselves. I love the mornings when the sun hasn’t quite made it over the cliffs and the light is diffused. Another favorite are low tides during sunset hour. 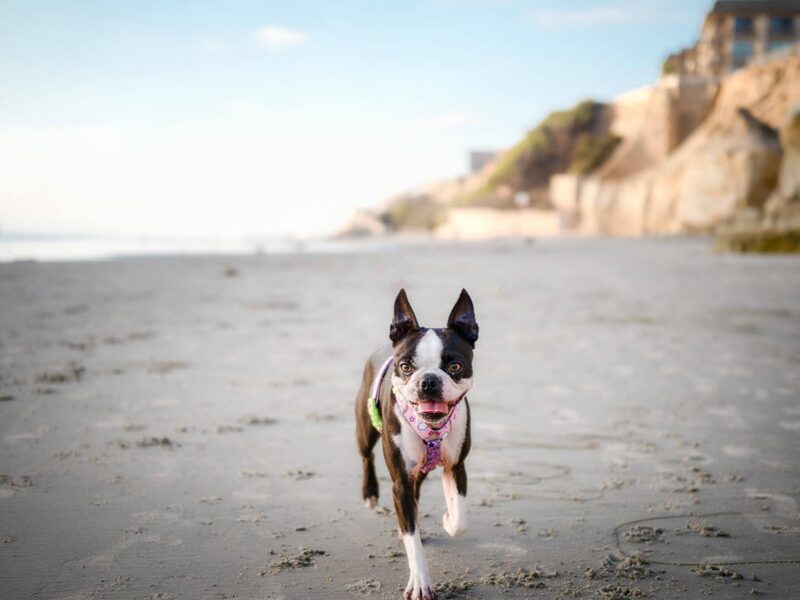 We also love coming on weekdays … you practically have the beach almost to yourself. 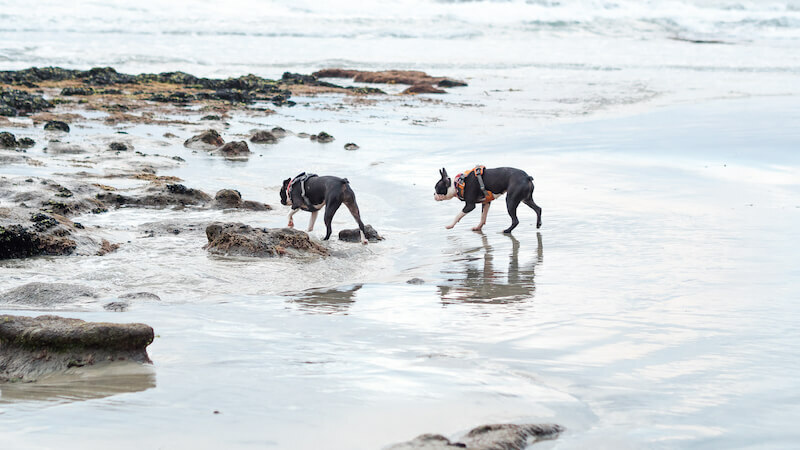 It’s not unusual for us to see a lot of “pairs” at this beach. 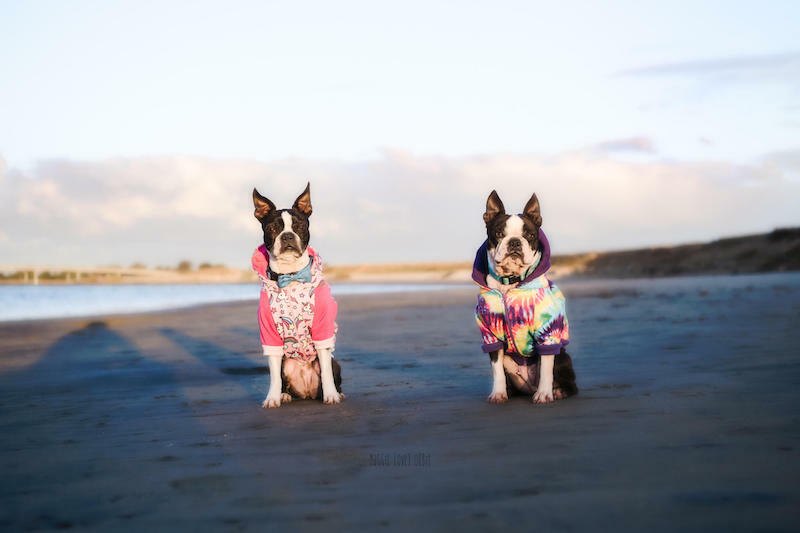 As in two great danes, two corgis, two australian shepherds, two doodles and then there’s us with the two Boston Terriers. 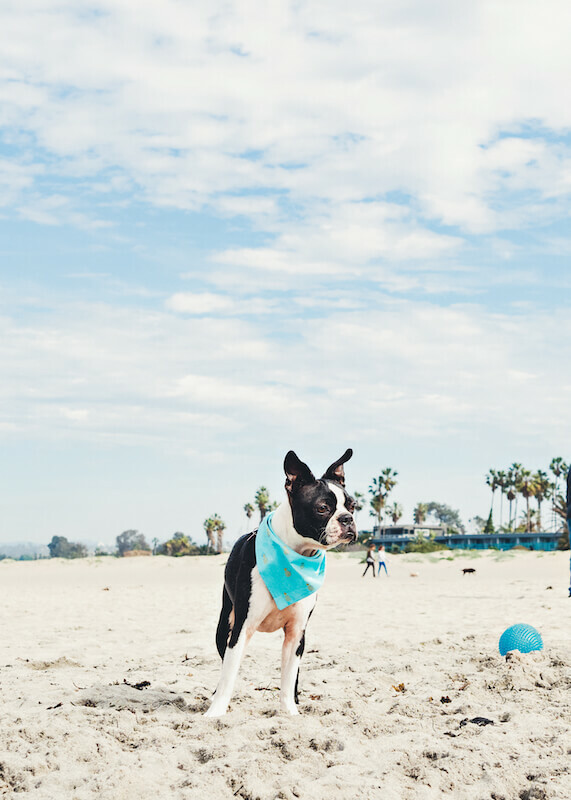 Named as the best dog beach in the United States – Fiesta Island is known for its multiple dog recreational areas. 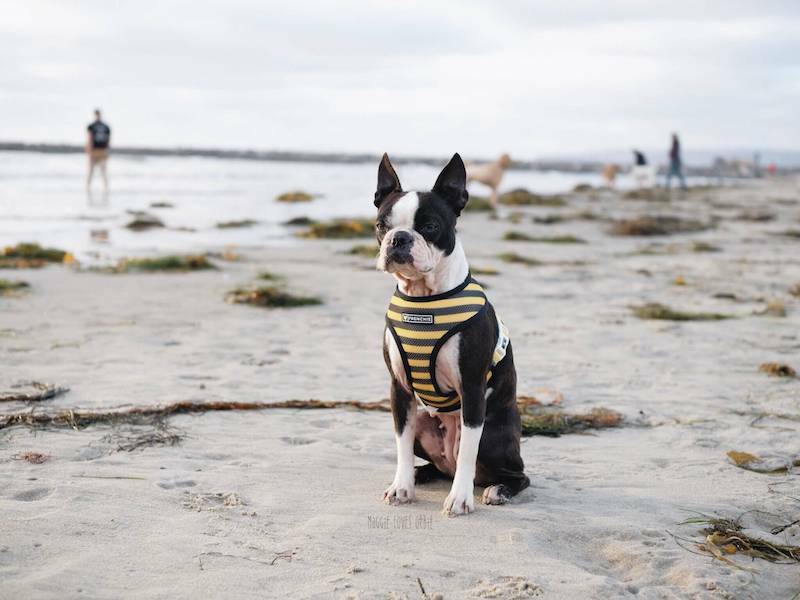 The main “dog beach” area is where 60% of the San Diego dog owners go. We started off going there but we found that with small dogs the energy at that main entrance was a bit more than we could handle. 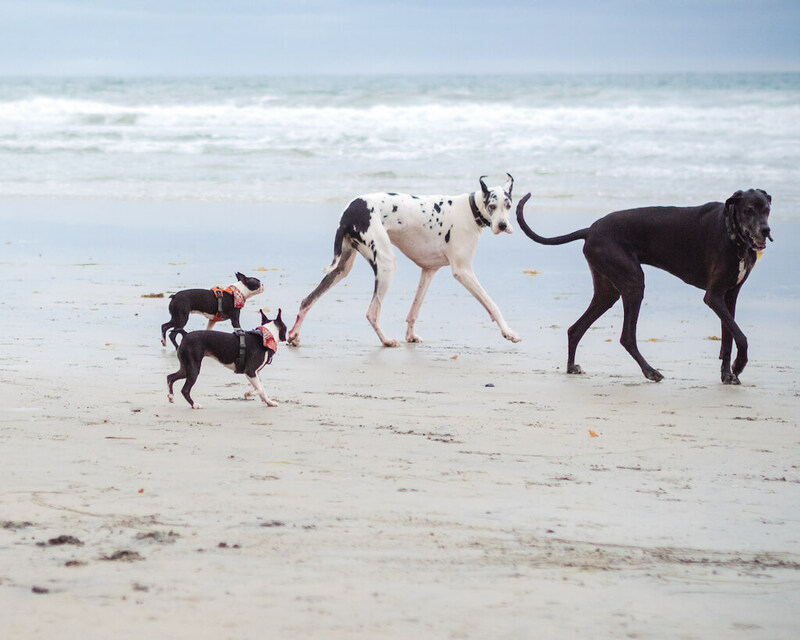 When dogs first arrive at the beach they are excited and pent up. And so we found an alternate place to park at the boat launch to walk the route along the water counter clockwise. There’s other areas of Fiesta Island you could park and explore. We typically avoid the middle section when the foxtails have bloomed. That said the middle section is our favorite in the late winter and first months of the year. When you can’t access the middle section …. It’s not the “prettiest” of beaches because it’s on the bay as opposed to the ocean so the water isn’t as clear. The sand is dark and there’s nothing luminescent about it. But that’s just me with my photographer’s mind talking. But when the rains come and the flowers are in bloom – it’s absolutely stunning. I am partial to having the beach to myself. That way the dogs can run and not have to compete with other dogs. 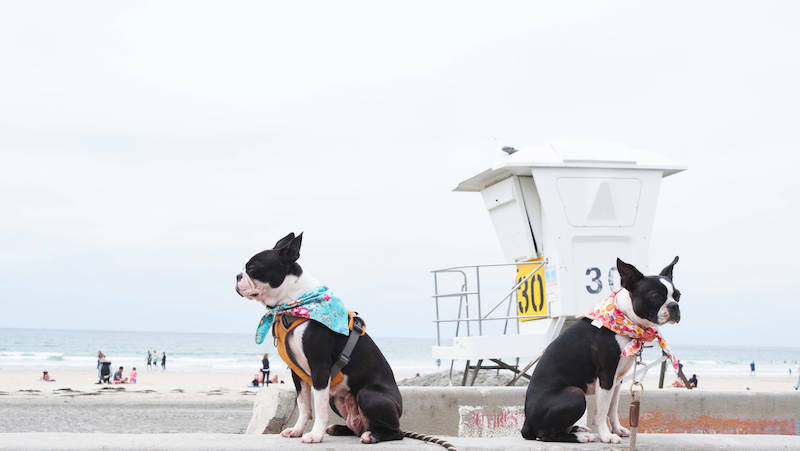 Ocean Beach is a busy dog beach frequented by all dogs of all breeds, age and sizes. High tide is powdery white sand. Low tide the water pulls out far and the sand is compact, darker and flat. This is a beach most people will go to “hang out” and picnic while their dogs play. I’d call this a high energy, high alert beach. In the sense that there’s a lot of other dogs around and I have to watch out for Maggie to make sure she doesn’t get herself into trouble with another dog. During low tide you can walk along the section where the lagoon meets the ocean and up to where the marsh grass is. The dogs love to smell the scents around here. Unless you’re going off peak hours parking can get tight so plan accordingly. Dogs allowed 6pm to 9am in the summer (April 1 to Oct 1) and 4pm to 9am in the winter. 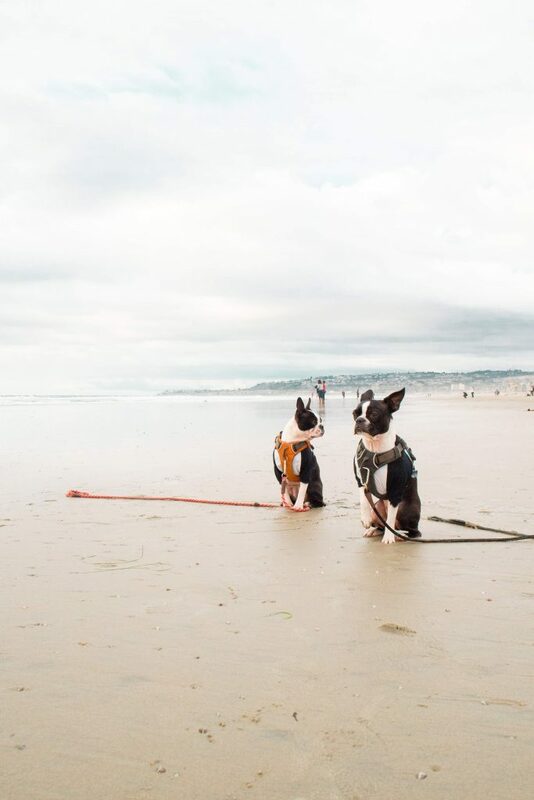 This beach does not allow off leash dogs. 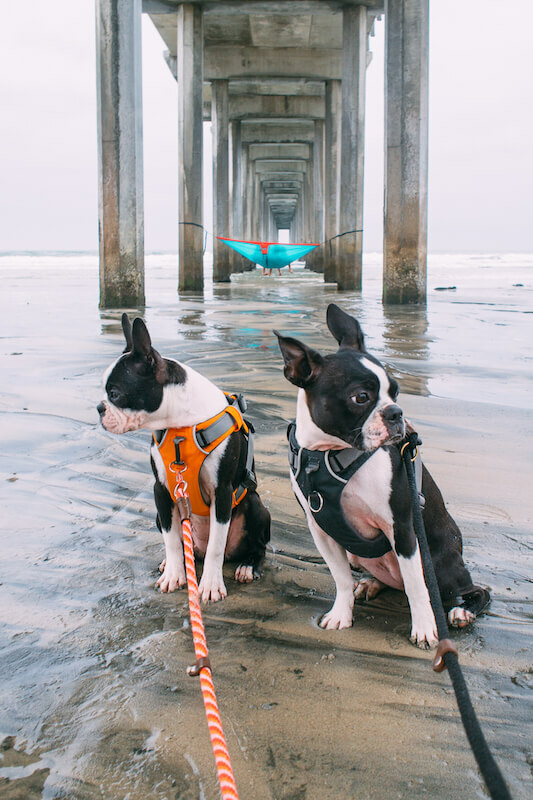 However during low tide if you’re up at dawn and walk past the pier then there’s an area you can let the dogs run (on the leash). Keep in mind fines can be upwards of $300 per dog if you are caught with them off the leash. 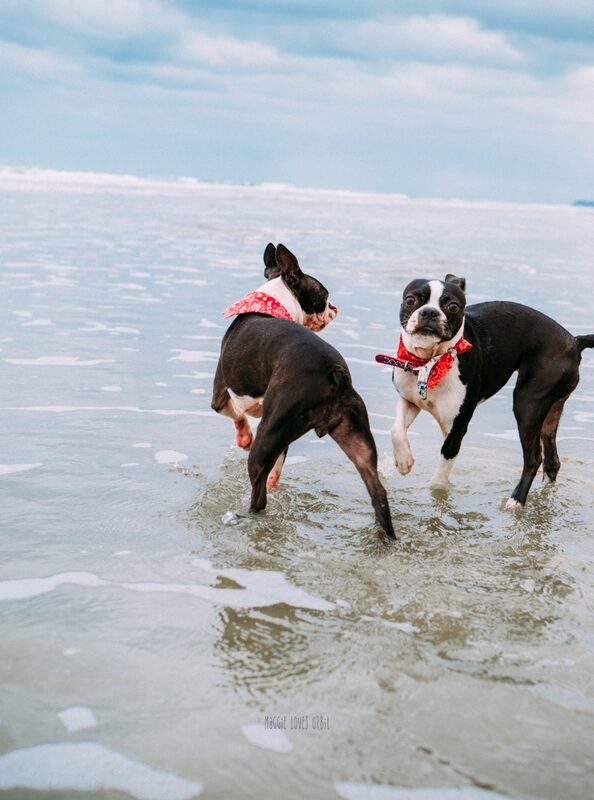 This beach does not allow off leash dogs. However this beach is well frequented by the active sports types (of humans). They have volleyball courts which are always full. The boardwalk is used by skaters, bikers and runners. If you park at the very end and start of Mission Beach and run to Law Street in Pacific Beach and back it’s 6 miles. Best beach to go to when you want distance and a work out. In the summer this beach is full of tourists. One of the most memorable times for us when we saw a sand kite surfer pass us several times. It was foggy and light was diffused but then at the perfect moment the sun peaked through the clouds. The sand is a soft white color so it was my favorite color of luminescent. 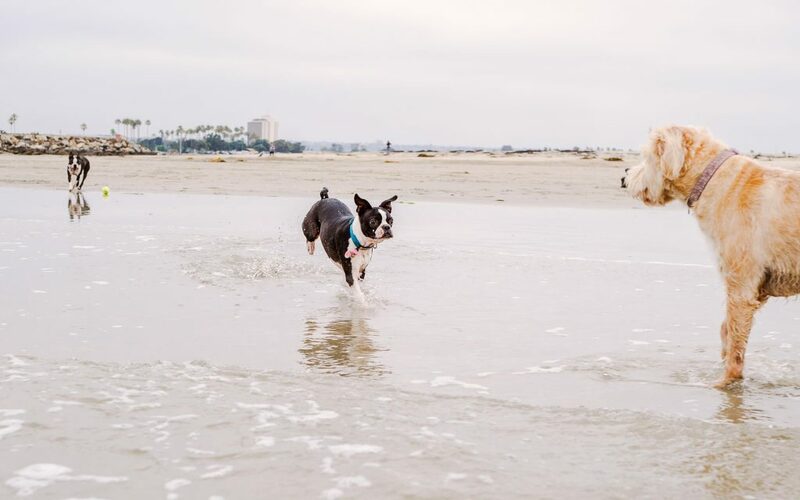 Pretty sure I initially fell in love with Coronado dog beach because of … Coronado. I feel that this beach gets the most non-regulars. 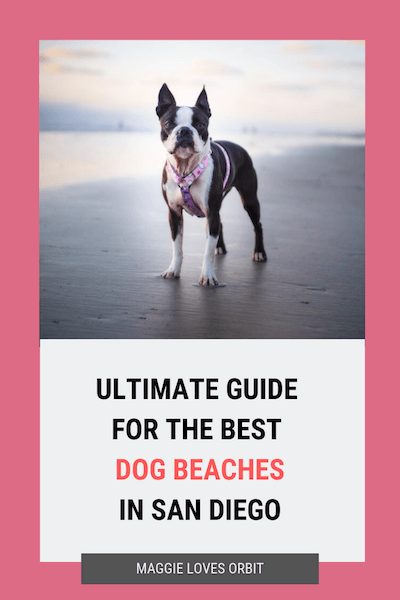 At some point you will bring your dog to this beach and unless you live in the area you won’t come to it as regularly. 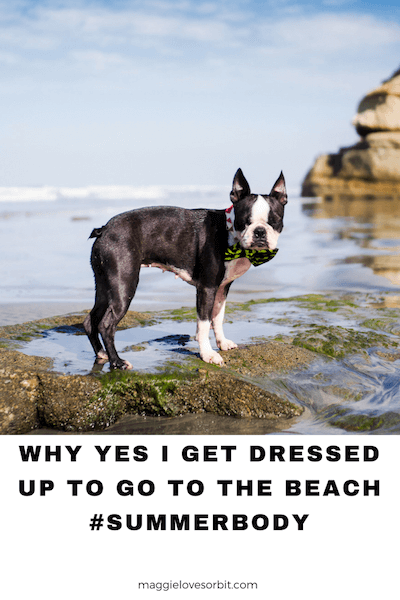 The main problem for me is that I find the sand too hot between the road and the actual dog beach. It’s quite a long walk. Or I like to call it a schlep. For some reason I also feel that because the beach is too small (compared to the other beaches) the energy is more chaotic. You have dogs that like to chase, dogs that like to tumble, dogs that like to smell, dogs that want to play fetch all crammed into a small dog area and you’re bound to run into someone. DISCLOSURE: Some of the links below are affiliate links, which means that if you click on a product link, I may receive compensation. This compensation comes at no additional cost to you, and as always I only recommend products I have tried and trust. 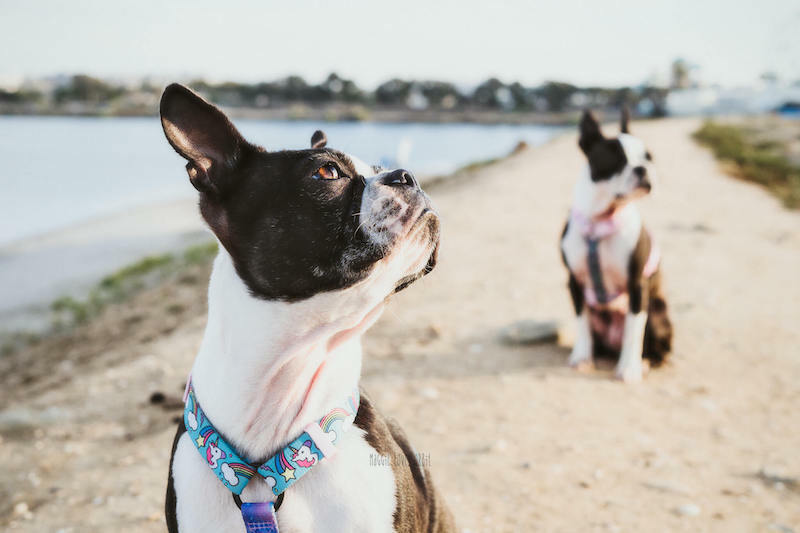 Maggielovesorbit, Ilovebostons is a participant in the Amazon Services LLC Associates Program, an affiliate advertising program designed to provide a means for sites to earn advertising fees by advertising and linking to Amazon.com.